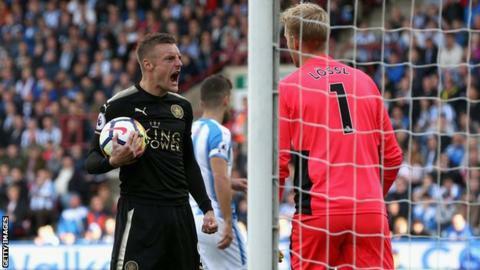 Jamie Vardy's second-half penalty earned Leicester City a point against a dominant Huddersfield Town at John Smith's Stadium. Andy King won the spot-kick for the Foxes after he was tripped from behind by Chris Lowe inside the box. The subsequent goal was the first that Jonas Lossl has conceded at home in the Premier League this season. The Terriers led through Laurent Depoitre, who scored the opener inside the first minute of the second half on his full debut in the top flight. The hosts found the back of the net again just after Vardy's equaliser, when Elias Kachunga got the final touch on Mathias Jorgensen's effort, but it was ruled offside and the goal was disallowed. Leicester had another penalty shout in the closing stages when Jorgensen made contact with Demarai Gray from behind, but referee Jon Moss didn't give it. David Wagner's side remain unbeaten at home in the Premier League and have risen to fifth in the table. Relive Huddersfield v Leicester here. Wagner was left frustrated by the decision to rule out Kachunga's goal and felt Huddersfield were unlucky not to take three points. Having watched the goal back, Wagner said Kachunga was "clearly onside". He added: "This was obvious and should not happen and was not difficult to see. "I am disappointed because I think we deserved the second goal. We have to accept that we only have one point but we were able to get more." The point favours a Leicester City side who have had a tricky start to the season with four points from five games. Other than their penalty, Leicester didn't have a single shot on target and produced only five shots throughout the match, compared with Huddersfield's 15. With 15 goals in his past 18 games, Jamie Vardy has found some of his form from Leicester's title-winning campaign. Shakespeare is constantly stressing the importance of Vardy's role in the team, but he was restricted to just three touches in Huddersfield's box on Saturday. It would have been four, and ultimately the winning goal when he missed a golden opportunity with 10 minutes to go. Riyad Mahrez whipped in a perfect cross towards Vardy at the far post. All he needed was a touch but it just wasn't his day. Shakespeare's side have now won just one of their past eight Premier League games. Although the fixture list has been kind to Huddersfield with games against Crystal Palace, Newcastle, Southampton, West Ham and Leicester, Wagner's side have shown they can be competitive in the Premier League. Their attacking style of play has been refreshing to watch, and with an average possession of 59.8% against Leicester, Huddersfield are not a team to park the bus and sit back. With Tottenham, Manchester United, Liverpool, Manchester City, Arsenal and Chelsea to come before Christmas, the Terriers will want as many points as possible. Their home form is going to be key, and although they remain unbeaten at John Smith's Stadium this season, they have won only one of their past five home league games. The fans were again like the twelfth man and the atmosphere was brilliant throughout. That will be vital, especially in the trickier fixtures. "Performance wise we played well. High intensity and very energetic. The performance was very good from my point of view. The whole team has shown a great attitude and great spirit. They showed the reaction we expected and we bounced back. I am disappointed because I think we deserved the second goal. "We were a little bit disorganised in the minutes after we scored and then we were a little bit unlucky and conceded the penalty, but we shouldn't forget it's Leicester who are a top quality side. We accept the point even if it doesn't feel good because we scored the second goal which unfortunately didn't count. "We've shown today again that we are capable and competitive and are able to stick to our way of football. We had one very poor performance and four performances where we were good and collected points. This is fair so far even when I think we were able to get three points today. "I think it has to be a good point. I said to the players if they offered us a point at half-time we'd have taken it. To go a goal down straight after half-time was disappointing and we had to show a lot of character. Scoring soon after was important, but in the first half we were second best. "We had quite a few players off the pace today but ultimately we have to be pleased with a point." Huddersfield have won just one of their past five home league games (D2 L2), after winning nine of the 12 before that. Leicester have registered just one clean sheet in their past eight PL games, shipping 18 goals in that period. Laurent Depoitre scored on his first Premier League start for Huddersfield, with only his second shot on target overall for the Terriers in the competition. Jamie Vardy has had a hand in 15 goals [12 goals, three assists] in 18 Premier League appearances under Craig Shakespeare. Since their return to the top flight in 2014-15, the Foxes have won 25 penalties, scoring 19 of them, only Manchester City [26 taken, 20 scored] can better them on both counts. Huddersfield travel to Crystal Palace on Tuesday in the EFL Cup, before returning to the Premier League on Saturday with a trip to Turf Moor (15:00 BST). Leicester host Liverpool twice in the space of five days. Jurgen Klopp's side will make the trip to King Power Stadium on Tuesday in the EFL Cup, and again on Saturday in the Premier League late kick-off (17:30 BST). Match ends, Huddersfield Town 1, Leicester City 1. Second Half ends, Huddersfield Town 1, Leicester City 1. Attempt missed. Islam Slimani (Leicester City) left footed shot from outside the box is too high. Assisted by Riyad Mahrez. Substitution, Huddersfield Town. Rajiv van La Parra replaces Laurent Depoitre. Attempt missed. Collin Quaner (Huddersfield Town) right footed shot from the centre of the box misses to the right. Assisted by Aaron Mooy with a cross. Substitution, Leicester City. Islam Slimani replaces Jamie Vardy. Substitution, Huddersfield Town. Jonathan Hogg replaces Abdelhamid Sabiri. Shinji Okazaki (Leicester City) is shown the yellow card for a bad foul. Attempt missed. Tom Ince (Huddersfield Town) left footed shot from outside the box is close, but misses to the left. Assisted by Aaron Mooy. Corner, Leicester City. Conceded by Zanka. Offside, Huddersfield Town. Danny Williams tries a through ball, but Abdelhamid Sabiri is caught offside. Attempt missed. Danny Williams (Huddersfield Town) right footed shot from outside the box misses to the left. Substitution, Huddersfield Town. Collin Quaner replaces Elias Kachunga. Attempt blocked. Riyad Mahrez (Leicester City) left footed shot from the right side of the box is blocked. Assisted by Demarai Gray. Attempt missed. Riyad Mahrez (Leicester City) left footed shot from the right side of the box misses to the left. Assisted by Shinji Okazaki. Substitution, Leicester City. Shinji Okazaki replaces Kelechi Iheanacho. Attempt blocked. Riyad Mahrez (Leicester City) left footed shot from outside the box is blocked. Offside, Huddersfield Town. Zanka tries a through ball, but Elias Kachunga is caught offside. Corner, Huddersfield Town. Conceded by Andy King. Offside, Leicester City. Andy King tries a through ball, but Kelechi Iheanacho is caught offside. Corner, Huddersfield Town. Conceded by Kasper Schmeichel. Attempt saved. Zanka (Huddersfield Town) right footed shot from the centre of the box is saved in the top centre of the goal. Assisted by Elias Kachunga. Corner, Huddersfield Town. Conceded by Danny Simpson. Goal! Huddersfield Town 1, Leicester City 1. Jamie Vardy (Leicester City) converts the penalty with a right footed shot to the centre of the goal. Penalty conceded by Chris Löwe (Huddersfield Town) after a foul in the penalty area. Penalty Leicester City. Andy King draws a foul in the penalty area.